You’ll be applying for clearance through your UKG WIP. The guys will advise on applying for your TKID. That part is done at 501st.com but requires UKG approving your costume. Haha. You won’t regret it. I’m a TRamp too and it’s been faultless for me. Your shoulder bells have a different gap, your left should come in a little more. Belt should come up a little more, it should sit just under the bottom ab button. 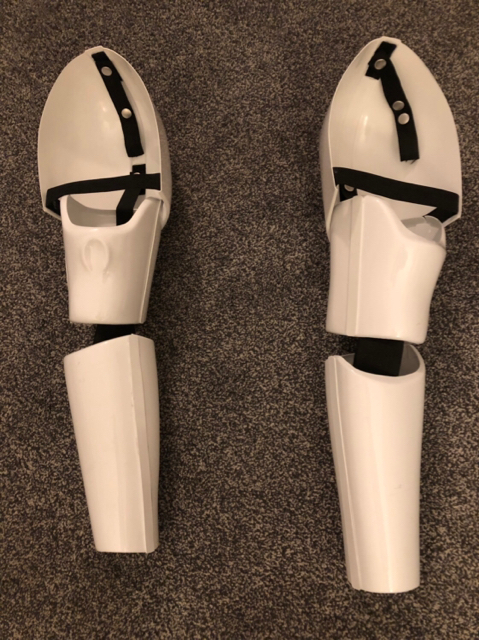 You have a big gap around the knees, I did too, so I added some foam on the inside of the shins at the bottom so when I closed them they sat higher up on the boots, not a hold up for basic will just look a bit better. Cheers. Will adjust shoulder bell and get it closer, just needs an additional snap. I’ve added some Velcro so will get the belt nudged up a bit. Good shout re shins, was going to add foam as they started to spin a turn a bit but also want them to sit higher. To close the gap as much as I can . Apart from the arms being on the wrong arms (doh, lol), I’d just highlight some of the return edges on the limbs. It looks like you have a lot of return edge on the lower thighs (near knees), top of shins, and also around the ankle - the ankle usually has zero return edge. Whilst this probably won’t affect approval, it might get mentioned if you apply for the higher levels. It might also be uncomfortable. Thanks buddy. You noticed the arms then? I have them labelled up, gotta be the first time I’ve put them on wrong. It did get picked up so will re do pictures. I was reluctant to remove lower shin return edge (boot end) as I need as much length as possible in them being 6’4” so I’m going to have to leave them. Other return edges I kept as I have really thin legs and hoped they gave a few cm extra depth as well as making it look a big more beefy. Will it be a deal breaker as nothing in CRL about return edges on majority of parts other than wrist end in forearms? No, shouldn’t affect clearance, just a personal choice really. If you choose to apply for EIB and Centurion, these will likely be mentioned as the screen used suits had less return edge - although, it’s not technically in the CRL so would more likely be a “suggestion”. If you watch the opening scene of ANH, you’ll notice that the armour still looks amazing even with the slightly shallower return edge. See how it goes, bud. Not long til you can get out there and troop. I have the AM kit too. I put some extra bends in to fit it right and put the rivets where they are in the pictures I referenced. These pics have Chicago screws holing it on but I’ve since bought the correct rivet kit from Troooerbay. It does the AB/kidney straps and the knee ammo belt and are centurion level split rivets and washers. Double cap or single cap rivets are also accepted. I prefer single cap or split rivets myself. Make sure to round the corners. The rivet locations in the thighs are easier to see on the inside of these pics. Been cleared. Just awaiting confirmation on TK number and find event to join. Button panels painted today, side poppers added, fashioning a slide catch to help keep it aligned. Elastics added to arm parts. Gloves ordered. Re measure of legs so hope to get them finished this week. Probably within a week to get confirmation of your number. Thank you, do I just keep an eye on the My UKG page for TK number to appear? Now cleared and have my TK number. What do I need to do to apply for EIB or Centurian level?